W.C. Fields once said, “Never work with children or animals.” Well, one of the world’s most famous canines is returning to television and it looks like producers will get to avoid working with both real-life kids and dogs. The character of Lassie the collie first appeared in a 1938 short story, written by Eric Knight. It was later expanded into a novel called Lassie Come-Home. An MGM film based on the book, starring Roddy McDowall and Elizabeth Taylor, hit theaters in 1943. That spawned additional Lassie stories in print, on radio and in movie theaters. In 1954, the Lassie TV show debuted on CBS. Aside from the famous canine, the family show features the talents of Tommy Rettig, Jan Clayton, George Cleveland, Jon Provost, June Lockhart, Hugh Reilly, Robert Bray, Jack De Mave, Jed Allan, Ron Hayes, Larry Wilcox, Pamelyn Ferdin, Cloris Leachman, and Jon Shepodd. 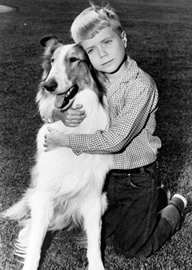 Lassie had a number of human friends during the show’s run but Provost played one of the most memorable, young Timmy Martin. The Lassie show ran for an impressive 17 years on CBS. It moved to first-run syndication for two more seasons and ended on March 24, 1973 with a total of 588 episodes. Though that series closed, Lassie didn’t leave the airwaves. An animated series called Lassie’s Rescue Rangers began airing Saturday mornings on ABC in the Fall of 1973. It had no direct relation to its live-action predecessor (other than the title character) and lasted for one short season. Should Provost be included in the new series? Yes! That would be great. In 1989, The New Lassie series returned the canine heroine to television for two seasons in first-run syndication. This time, Lassie was owned by the McCullough family. They are played by Christopher Stone, Dee Wallace Stone, Wendy Cox, and a young Will Estes (credited as Will Nipper). Provost, who’d played Lassie’s young owner on TV from 1957 to 1964, played Uncle Steve McCullough on the new series. In a strange twist, it was later revealed that Steve was actually the grown-up Timmy and Lockhart reprised her role as Timmy’s mother for one episode. Fellow Lassie veterans Rettig and McDowall also made guest appearances during The New Lassie’s limited run. In 1996, Lassie returned to television, this time in a Japanese anime series. A Canadian live-action show followed in 1997 and 10 years later, Lassie became the co-host of a reality TV show on PBS for Lassie’s Pet Vet. Now, Lassie is poised to return to television in a new set of adventures. Partnered with Lassie rights holder Classic Media, DQ Entertainment is set to co-produce a 3D cartoon series. The two companies previously worked together on the CGI project, Casper’s Scare School, based on the classic friendly ghost character. With other partners, India-based DQ has also produced a 3D Iron Man series, Mickey Mouse Clubhouse, and many other animated projects. The new Lassie animated series is set to begin airing in late 2010 or early 2011 and 26 half-hour installments have been ordered. I watch Lassie (Jeff’s Collie) every morning on COZI tv. I am really enjoying it since I really didn’t know it much before Timmy. (Too young) I like Porky and that funny little call “Eee-Ah-cheee” So Jeff’s mom did not marry Clay the deputy? I always wondered! I would love to see Lassie come back on regular tv series I love LASSIE, I grew up watching Lassie. Wish they would keep it on so the kids who have never seen Lassie would be able to see how Lassie has so much love for everyone. And maybe ppl may see that animal abuse does not need to happen dogs has so much love foe people if you just let them. Love my LASSIE. I absolutely loved watching almost every episode of Lassie over the years! I have been trying to find the name of Timmy’s best friend and the name of his dog. The boy was a somewhat overwieght for his age and I think the dog was a bassett hound or beagle. It seems that it had short legs. I would appreciate any help in finding out this information. Thank you. That would be Boomer and his Jack Russell Terrier, Mike. Yes, that’s absolutely right, just to confirm for the Asker. Timmy’s little portly friend was ” Boomer” and Boomer’s little white dog with tan markings, was a Jack Russell Terrier, ” Mike”, who would stand up on his back feet, turn around that way, and be charming (apparently a Jack Russell Terrier behavior). It would be great to see Lassie again even in cartoon, which I would watch if I had small children or grandchildren. Dog shows always steal my heart, they teach wonderful things and are just great clean pure entertainment. Good luck to everyone involved. I like to see Lassie comback to Tv.That would be great.Shes a great collie.I Remember Lassie in the 1994 movie Lassie.Shes a great dog. I like to see her back on Tv by 2010 or 2011. Lassie is in reruns ..I get the show on cozi tv..Check your tv listings (Cozi tv is listed as WMFP… Just got through airing on MeTv , I asked the station to bring Lassie back…Hope this helps…. jon is a great guy and loves his fans. (has a great wife, laurie, too!) i would like to see jon acting more. thanks for writing the nice article. I agree, it would be great to have a new Lassie series on TV so that a new generation of kids could be introduced to the character. Hopefully, the original Lassie series will also be released on DVD when the new series airs. Jon Provost belongs to Lassie like salt in a soup.So I voted for Jon,that he will be included in the new Lassie series. Hooray for Lassie! I’d love to see a new Lassie series with the real dog again but it’s time to move on from Lassie & Timmy. BTW, Your photo of Jon Provost is not with Lassie! Lassie has always had a full white blaze going up the center of his nose!